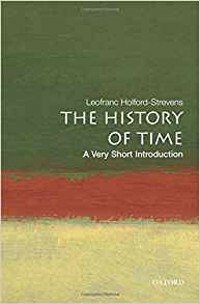 Leofranc Holford-Strevens 2005 The History of Time: A Very Short Introduction Oxford University Press, 2005. Holford-Strevens' discussion is kept at an introductory level, the glossary is necessary. The study of time keeping, days, and calendars requires learning a little specialized vocabulary. And while Holford-Strevens does a good job explaining terms, once they are explained the terms are used. The book is an introduction. This means that there are no large discussions over controverted issues, no detailed footnotes. But, the discussion and presentation is based on very sound scholarship. The brief discussion in the text does make reference to primary sources where it is beneficial. And Holford-Strevens includes an annotated list of works for further reading. Seven chapters are followed by two appendixes, a list for further reading, a glossary, and an index. The introductions to these topics are very helpful in demonstrating not only where certain concepts and structures came from, but also how they were discussed historically. For example, subdividing the month into 7-day weeks was not a common idea in ancient times. The Romans, from whom our main system of months derive, actually used an 8-day market cycle. It is called nundial (nine-day). The Romans (and to some extent other cultures too) used an inclusive count for days. Thus a "nine-day" was a Roman market "week" consisting of eight days, starting over again on the ninth day. In the Gospel of John when the disciples are gathered on the "eighth-day" that means a week later, the same day of the week as before. "The third day" is today, tomorrow, and the third. All in all, the introduction is very helpful for western and near eastern calendars. Holford-Strevens also discusses Chinese, Japanese, and Mesoamerican calendars. While these latter calendars fall a bit outside my research interest, I would still say that this volume's introductions to those calenders were, perhaps, too brief to be helpful. It is "very short"--only 142 pages in a 4.5x6.75 inch volume, just over 1/4" thick. There are 26 illustrations, mainly of ancient calendars. The format of the book and the size of the page makes many of these illustrations hard to see. For example, the first illustration "Detail of Egyptian diagonal calendar" is photo reduced to fit 5 3/4 x 1 1/2 inch space. This makes any features noted of the calendar in the text very difficult to see because of the small size. Illustration 12, a photo of a sixth century mosaic of Dionysius Exiguus's tables for calculating Easter is printed inverted. Leofranc Holford-Strevens is also co-editor/author of The Oxford Book of Days (2000), and The Oxford Companion to the Year (1999). Review: Stern, Sacha. 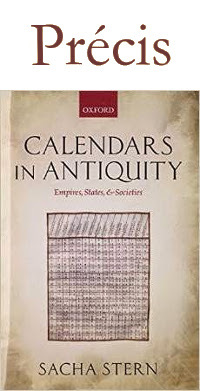 Calendars in Antiquity: Empires, States, and Societies. Stern has done extensive academic research and publication on the reckoning of time in the ancient world, especially as those relate to the peoples and cultures of the Bible. 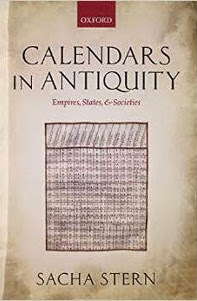 Calendars in Antiquity is 430 pages, 20 page bibliography, and index. In this review I will focus on just a few of Stern's arguments with some detail and then summarize. My hope is to help draw out some examples of the benefits of this work to the Biblical exegete. Stern's methodology is to focus on the historical cultural aspects of how calendars functioned in their societies and the societal influences that can be shown or reasonably understood to have influenced the changes. Since those influences can be very broad, Stern focuses particularly on the political aspects of cultural forces. Stern limits his calendrical focus chiefly to units of time as they affect annual reckoning. Thus he does not go into detail on how each of the different societies reckoned the hours of the day except as it relates to how the begining of a month or year was fixed. He also limited his study to societies of Classical Antiquity and their interactions leading to the development of the Julian Calendar in late antiquity. Stern does not include calendar traditions from the Far East, ancient America, or later developments like the Islamic calendar. Part I: From City States to Great Empires: The Rise of the Fixed Calendar. Part II: The Empires Challenged and Dissolved: Calendar Diversity and Fragmentation. The first part looks at how the various societies that participated in Classical Antiquity reckoned time. In ancient Greece and Babylon (Chaptes 1 and 2) the calendars were lunar, as was the calendar of Republican Rome. The evidence from Europe also leads us to conclude that the Celtic/Gaulic and German calendars were also lunar. And there was, for example: among the Greeks and Babylonians, great variety in naming and reckoning months, festivals, and when the new year was to be counted. Individual city-states kept their own month-names and methods of intercalation. This is shown by multiple dating on inscriptions of treaties and contracts. Intercalation and calendar "tampering" were essentially political tools which not only helped keep the lunar reckoning of time in line with the yearly seasons, but also allowed rulers to do things like: avoid missing a religious festival because a battle was taking place; extend the days to allow tribute and taxes to be brought in before a deadline; and extend their term of office. In the case of the Babylonian city states and the rise of the neo-Assyrian (8th-7th cent. BC) it was the king who declared the first of the month. The process of unifying calendars between these groups took place when city-states formed alliances or were made part of a larger regional political power. Stern argues that these lunar calendars were not less rational, less scientific, or less emperical than our current Gregorian/Julian Calendar. These calendars were actually very much emperical as they depended upon the actual observation of the new moon to establish the beginning of a month. The intercalations were based on both natural and societal realities (agricultural, political, and religious). And, being tied to the moon, they were solidly based in a method of reckoning that was available to and understood by most members of their societies. They were not origninally solar nor were they originally stellar calendars. Thus the first month (moon) of a year would not begin on the same day of the solar year as we reckon time. Religious festivals, which also varied from one city-state to another, could be delayed with intercalation (the adding of a month) or hastened by suppression (ignoring or eliminating days from the count). But they were not at first tied to solar events (equinox, solstice, etc.) nor to the direct timing of stellar events (the heliacal rising of Pliedes). The development of astronomical calendars in Ancient Greece from the late 5th century BC (Meton) and early 4th century BC (Callippus) is a feature limited mainly to Athens. Stern uses inscriptional and historical writings from the period to demonstrate that the astronomical calendars were not used for civic dating. For example, astronomical dates based on these reckonings are ignored by Herotodus and Thucidides. Medical works from the Classical period reference astronomical phenomena, but not as a chronological dating tool. It is only in later with writers [like Diodorus and Geminus (mid to late 1st cent. BC)] who project the Callipic Cycle or Metonic Cycle back upon historical events as an absolute chronological dating scheme. Other lines of evidence include the later (3rd cent. BC) introduction of the parapegmata (a calendar peg-board set up in public) which mentioned astronomical and weather events as part of the count of days. For the early Babylonians the calenders consisted of months of either 29 or 30 days. This calendar length of the month determined by the sighting of the next new moon. The unification of calendars in Mesopotamia began in the 2nd millenium BC and is tied together with the unification of the city-states under the Assyrian kingdom in 1100 BC. From the influence of this kingdom the month names it chose as standard were spread throughout its region of influence. These month names and calendar practice influenced also the names of the months and how they were reckoned by the people of Israel as they settled in Canaan and were impacted by Assyria and neo-Babylonia. While literature of astronomy/astrology began earlier in Mesopotamia than in Greece (Astrological Omen Lists, letters of astrologers to kings), the chief calendrical function of the astrologer was to site the new moon and report to the king. These documents demonstrate that they had the astronomical knowledge to predict when the new moon should occur. However the calendar still depended upon emperical sighting and political authority. The king would choose to declare the new month. The year consisted of 12 or 13 months, depending upon choice of intercalation. Reports of new moon sightings from the astrologers to the king become very rare from the 6th-1st cent. BC. However, a group of documents called the Astronomical Diaries yield a great deal of information that allow for reasonably precise dates for this period when the modern calendar is retrojected upon the Babylonian lunar calendar. Stern points out that even though there is a very high degree of astronomical knowledge, this did not effect a change from a lunar to a solar calendar. The basic change in the calendar from the older to the newer is in a greater reliance upon predictions of new moons. This reduced dependency upon the limits of a courier to relay the proclamation of new moons, allowing political administration of wider territories. It is not until the Achaemenid period (5th cent. BC) that evidence of a fixed calendrical cycle to regulate the lunar year. Firm evidence exists from Cyrus' conquest of Babylon in 539 BC. The main evidence comes from the astronomical texts called MUL.APIN and the Saros Cannon texts. By the Selucid period (312-63 BC) a method of calculating the vernal Equinox was developed. This method differs from modern methods and yields different, usually later, dates than the actual equinox. But this calculation seems to have had no clearly evident affect on the method of intercalation used for the Babylonian calendar. Data of regular intercalations for the Parthian period from AD 224 and following is unclear. The Babylonian Calendar remained lunar, but became more fixed through time. The method of regularizing the calendar remained true to its emperical use with the lunar month through better and more reliable predictability of the new moon. This reliability of prediction allowed for the calendar's use over a much wider area of political control. The Babylonian Calendar influenced many regional and local calendars. Both its naming conventions and its methods were incorporated by subject peoples. The calendars of the Old Testament Israelites were strongly influenced. The Egyptian Calendar (Chapter 3) represents the only fixed (and ideally solar) calendar in Classical Antiquity. But as the Egyptian Calendar was fixed at 365 days the first day of the year drifted forward through the actual solar year by 1 day every four years. This method of reckoning the number of days in the year was adopted by many peoples. The Persian Zoroastrian Calendar, for example, used the same 365 day scheme with the first day of the year moving one solar day earlier every four years. There is no evidence of the Zoroastrian Calendar before the 6th century BC. Also, the only period at which the Persian Zoroastrian Calendar year actually began on or near the vernal equinox was the years 481-479 BC. The source of Egyptian influence most probably came after the Achaemenid empire conquered Egypt under Cambysus in 525 BC. Likewise, the Egyptian Calendar's soar length year became the basis for the Julian reforms of the Republican Roman Calendar. Julius Caesar included an extra day every fourth year. This was to prevent the solar drift that occured in the Egyptian and Persian Zoroastrian Calendars. The use of a fixed, predictable calendar was a tool of empire that allowed the Romans to manage a much larger region of influence more conveniently than under the previous lunar calendar of the Republic. However, the Julian Calendar reforms were not carried out well at first. The use of inclusive counting by Romans appears to have lead to an over intercalation of leap years in the early period so that Augustus had to revise the leap year schedule temporarily in 8 BC. Also, while the calendar reforms spread very quickly and widely in the western provinces of the empire, the eastern provinces retained a great deal of calendar independence. The calendars of Antioch, Gaza, Ashkelon, Jerusalem, and many other cities individualistic. Often they adopted the form of the Julian calendar but retained regional cultural names for the months; maintained a different new year's date; or --as in the case of Jerusalem-- kept a parallel lunar civic calendar that was important to the culture and religion of the local people. The adoption of the Julian reforms in these regions also was not immediate, in some cases not being adopted until the end of the 1st or mid 2nd cent. AD. In his second part, Stern describes various examples and ways in which local cultures expressed a kind of dissidence to political authority or subversion by modification of the Julian reforms. The data and study of the evidence in the above mentioned examples are more than sufficient to recommend this work to the Biblical exegete. The research presented on the Gallic and Jewish Calendars in the sixth chapter stand out as especially useful. But the closing chapter is extremely valuable. "Secterianism and heresy: From Qumran Calendars to the Christian Easter Controversies." In this chapter Stern describes, among other things, some of the formative issues for the Rabbinic Calendar as a distinct expression differing from the Judaean/Palestinian Calendar that preceeded it. And in his discussion of the development of the Christian Calendar Stern brings out some very good arguments about how the Christian Calendar began be a confession of Orthodoxy. Highlighted in this discussion are groups which diverged from this calendrical confession for the purpose of expressing their distinction from the Orthodox Catholic Church, such as the Nestorians, Novations, and the Arians when they were opposing the reinstatement of Athanasius. While Stern's focus is mainly on the political aspects of these divisions, combining his research with a reading of doctrinal and liturgical history is very helpful and enlightening. The book is expensive. $180. Perhaps one can find it for less than that somewhere online. But I would highly recommend this book for seminary libraries, college libraries, and for those interested in chronology, chronography, ancient history, doctrinal history, and the history of the liturgical year. pp. 281-299 in I. Finkelstein and N. Na'aman (eds. ), The Fire Signals of Lachish. Studies in the Archaeology and History of Israel in the Late Bronze Age, Iron Age, and Persian Period in Honor of David Ussishkin, Winona Lake 2011, 281-299. This article is important with respect to the relationship of archaeology and the claims made about the past based on archaeology over against what can be learned from textual evidence. Nadav Na’aman is Professor of Jewish History, Emeritus of Tel Aviv University, where he served from 1975 to 2007. He is a renowned authority on the Amarna Letters with long experience in Archaeology, the Ancient Near East, and the history of the Amarna Period, and other topics. In 1887 the first 358 tablets of the Amarna Letters were discovered in Amarna, Egypt. Another 24 tablets were recovered later in the 20th century. The tablets are written in Akkadian cuneiform and consist mostly of diplomatic correspondence between Egypt and its subject kings in Canaan and Amarru. The correspondence covers about 30 years during the XVIIIth Egyptian Dynasty, starting in the last few years of Amenhotep III’s life. This period is now thought to start just before 1350 B.C. and extend down to the 1320s, though there are enough perplexities in Egyptian chronology which could argue for as much as 30 years earlier for the beginning of this period. Na’aman’s article presents a test case concerning the intersection of archaeology and documentary history through the examination of the political, geographical, and personal references in a small set of letters from the Amarna tablets which deal with a rebellion in the Shephelah called the Qiltu Affair. This grouping of letters is called the Shephelah correspondence. In his second section Na’aman investigates the archaeological evidence for the Shephelah in this period. But his results poze a puzzle. He explained some typical assumptions about what an archaeologist might expect to find with respect to governing centers. He asks; “Can archaeological research produce evidence for differentiating the centers of city-states from secondary towns in their territories?” “Upon reading the seven letters sent from Jerusalem, scholars would expect the excavations to reveal a medium-sized, thriving city in the Late Bronze Age, but these expectations were totally dashed.” There is a huge discrepancy which he believes can be explained “by the state of preservation of the settlement strata from the Amarna period.” Similarly with the archaeological record at Gezer Na’aman states: “If our knowledge of the place were based entirely on the archaeological findings, we would have concluded that Gezer was, at most, an unimportant city-state, and no one would have thought that it was one of the leading city-states in the array of Canaanite city-states during the Amarna period.” Regarding Lachish he writes: “We may state with certainty that, without the historical documentation, scholars would have assumed that Late Bronze Lachish became an important city-state only in the 13th century” after the Amarna period. For the third section Na’aman focuses a “prominent feature in the ‘Shephelah correspondence.’” These are the problems of rebellion and political and social unrest reported in the letters. These features “require elucidation.” He focuses on one particular event called the “Qiltu affair” to demonstrate how significantly careful study of the textual evidence fills in our information about the events of this region which are invisible to archaeology. This section contains careful analysis of the relevant Amarna letters which speak of this event. Na’aman also draws a political parallel with similar events of 1 Samuel 23:1-13 during Saul’s reign. In Na’aman’s fourth section he analyzes the record of “rebellions in the Shephelah in the Late Amarna Period.” This section also contains careful analysis of relevant Amarna Letters “in order to establish the identity of the social groups that operated in the related events.” Several letters are scrutinized, and Na’aman draws a relatively clear historical but tentative reconstruction of these rebellions and their causes. In his conclusion, Na’aman points out that there “is a marked contast between the Egyptian inscriptions, which entirely ignore the Shephelah region (except for Gezer) and mention only toponyms located outside its area, and the Amarna letters, which show that the Shephelah played an important part in the Egyptian administration of Canaan.” Na’aman highlights some of the main insights given by the Amarna letters. “The archaeological excavations and surveys supply important data that is not illuminated by the documentary evidence.” And the archaeological evidence must be used in light of the textual evidence. And the Egyptian topographical lists from the time period need to be reevaluated with respect to both their purpose and meaning rather than concluding that they would mention issues based on the expectations of historians or archaeologists.